Description: Nee WM, shortly before a trip to the paint shop for a YN2 suit. 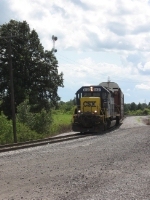 Description: CSX 8421 is in the yard in Raleigh, N.C. Description: CSX 8005 & 8421 lead a northbound train out of North Collier Yard at Petersburg, Va. Description: As storm clouds head east, behind Q39730 with CSXT 8421, 7504, & 5390 the westbound fleet starts to arrive at Fostoria, Oh., with the sun going down, as seen by another headlight at East Fostoria, at Fostoria, Oh. Description: A wider view of Q418's power. Description: A former Western Maryland SD40 is second out on Q418. Description: Q418 has a limited clear at Wood as it passed some trespassers seemingly oblivious to the train's passage. Description: Engineer leans way out the cab to check his reflection in the Schuylkill River below as Q418 rolls eastbound through CP River. Description: Taking it easy on Christmas Eve. Description: Taken from the Capitol limited, this is some power sitting at cumberland yard. Description: CSX Q626 with 6 locomotives. 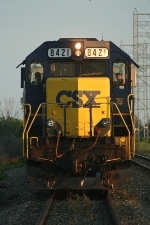 Description: CSX 8421 as the third unit on CSX Q626. Description: All 6 locomotives on CSX Q626 and a clear signal.